I was recently working with one of my clients on a rather difficult task, and he suggested we stop and do something else because the task was too hard. I asked him who would complete the task if we stopped, and he looked at me as if I were speaking Martian. It occurred to me that he did not see a future consequence to just quitting. He was only considering the immediate gain. So I asked him if the rocks in a crucible should get out when the crucible starts to get hot. If they could they would be hot rocks until they cooled, but there would be no long-term change. They would still be rocks. However, if they stayed in the crucible and accepted the heat; in time they would be able to revel in their purity. The former rocks could become something better. They could become metal! They would be harder, and more formidable. The best part of this transformation is, now they can be shaped into something special. They could be shaped into something with an expert purpose. They could become either a scalpel or a hammer. The point is they could become something more. Something that has been changed at its core. 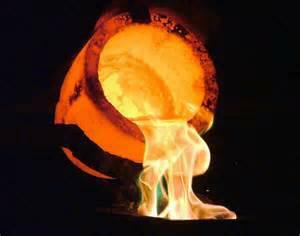 Starting and running a business successfully will require you to accept the heat of the crucible and learn from it. Ultimately, you will be MORE than you were before. Every challenge you face as an owner is a crucible. Some are hotter than others and some last longer than others; but, if you persevere, you may be running your own fortune 100 company very soon. If you quit, you’ll just be another “Hot Rock” that couldn’t take the heat!